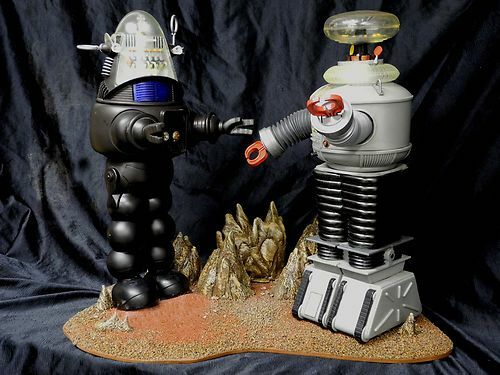 A unique custom made diorama featuring the B-9 Lost In Space YM-3 Robot and ROBBY THE ROBOT from Forbidden Planet both made by Masudaya. 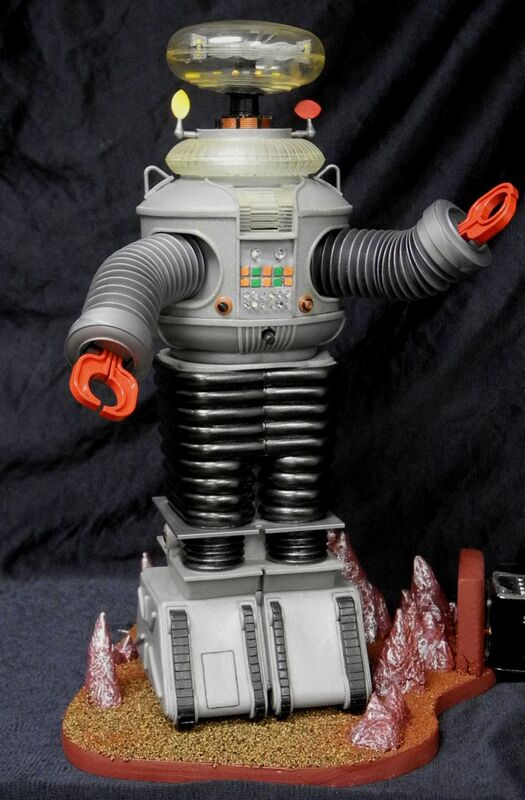 WAR OF THE ROBOTS were the B-9 robot meets Robby the Robot. Will Robinson and Dr. Smith stumble upon another robot on a alien planet that is even more capable than their own. The alien robot sets out to gain the confidence of the Robinson family because, at a future critical point, he plans to transport them to his home planet as slaves. Both robots are 1/5th Scale (16 inch). Robby and the B-9 Robot have been heavily customized. 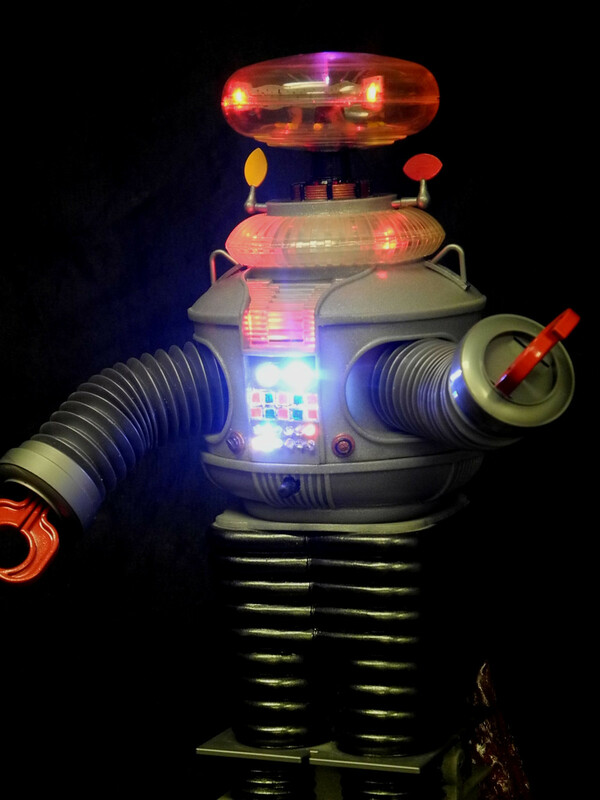 All the molded lights on the B-9 robot were replaced with a combination of solid and flashing leds. Also added were leds in the robot's neck, head and mouth. A total of 25 leds were used to customize the B-9 robot. 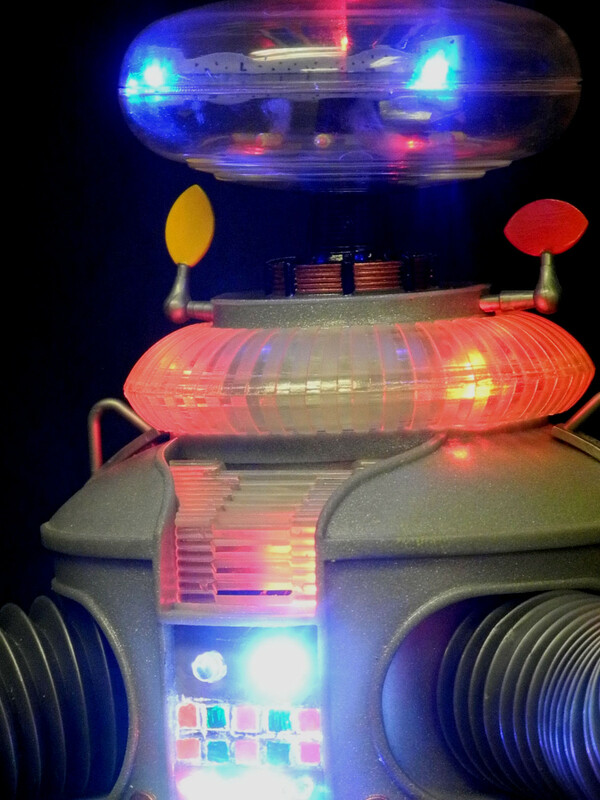 Robby the Robot not has multiple leds installed to light up his mouth and head. 9 leds were used to light up Robby (a total of 34 leds for both robots). The leds are operated by a 9V battery hidden in the robot's body. A quick turn of there heads and the head comes off to expose the battery. The switches are located on the front of each robot just under the mouth. 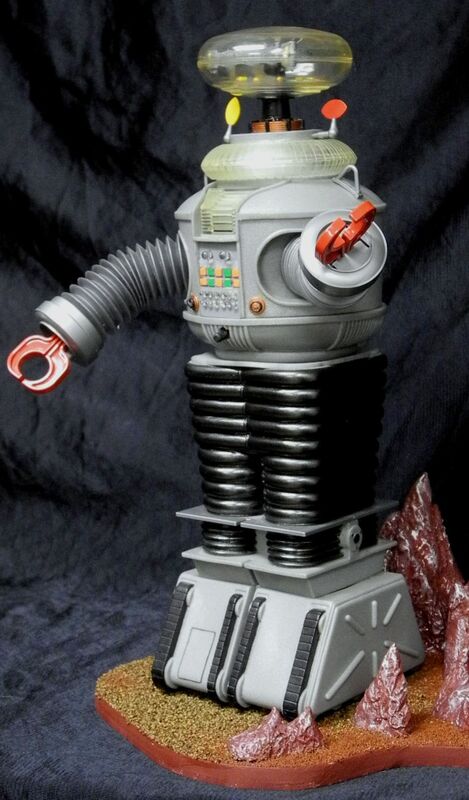 Robby the Robot not has multiple leds installed to light up his mouth and head. 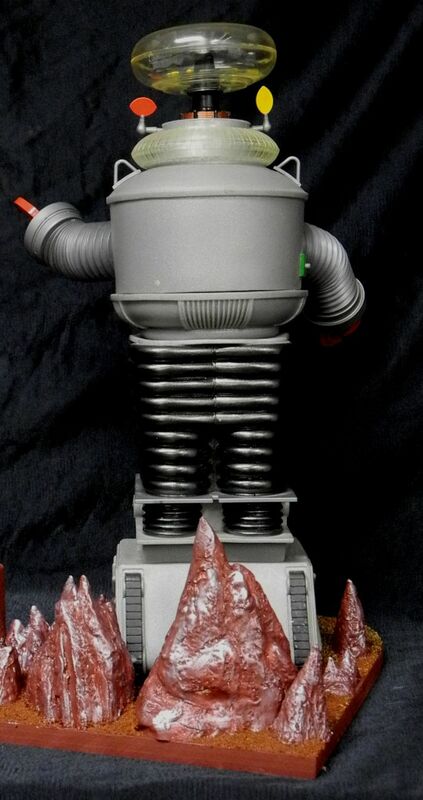 The original voice boxes in both robots (which were pretty bad) have been replaced with a high quality HI-FI recorder starts with the music track from Forbidden Planet then go into the dialog between the two robots from the War of the robots episode with some famous quotes from the robot and ending with the music track from Lost in Space. The sound track is programmed to play (in stereo) for 20 minutes unless you stop the playback. Using the control buttons on the back of the recorder you can increase or decrease the volume, fast forward or rewind. After shutting off the sound the next time you activate the sound track it will start playing at the beginning of the recording at the sound level it was last set at. 3 AAA batteries located in the back of the diorama powers the recorder. The switch is located just behind the B-9 robot camouflaged to look like a small rock. The base is totally custom built from scratch using solid wood, different colored gravel, small rocks and larger rocks made of solid resin.